I’ve been involved with Ignite Portland from the very beginning. I helped get it started five years ago, and helped lead the planning of the event nine times. I’ve taken a break from planning the event, but it will always hold a place in my heart. 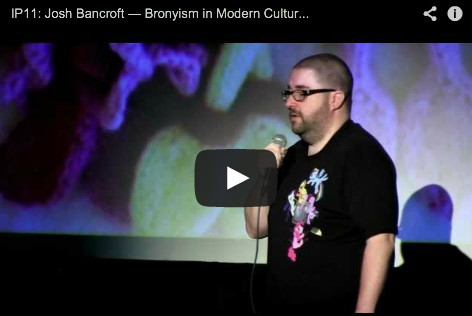 After Ignite Portland 10, almost on a whim, I submitted a talk proposal entitled “Bronyism in Modern Culture: WTF is Up with My Little Pony?!“. Fast forward a few months, my talk idea was selected, and I shared it in Ignite format (20 slides, 15 seconds each, total of 5 minutes) on stage in front of about 500 people at Ignite Portland 11 on September 19, 2012. The highlight of the event was the people who came up to me afterwards, to introduce themselves as fellow bronies and pegasisters. Sometimes boldly, sometimes bashfully. It was wonderful to meet them, and share that connection. Some people commented to me that I was really brave to share what I did, but it didn’t feel like bravery to me. Sure, I was a little nervous (about talking, not about the topic). But I was able to share something I love in front of a large audience, and I didn’t die. You won’t, either. Keep that in mind the next time you’re facing something that makes you nervous.